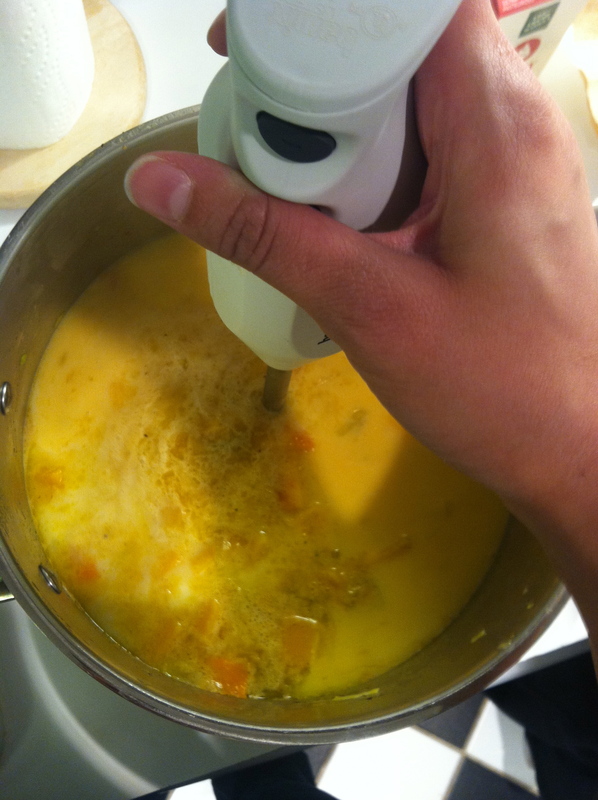 Creamy Butternut Squash Soup; Do YOU need all 10 fingers? Let’s have some real talk, folks. Do we really NEED 10 fingers? Doesn’t 10 seem like a lot? Are we being a little bit greedy? Anyways. No pinkies. No right hand ring finger. And you could probably lose at least one pointer. 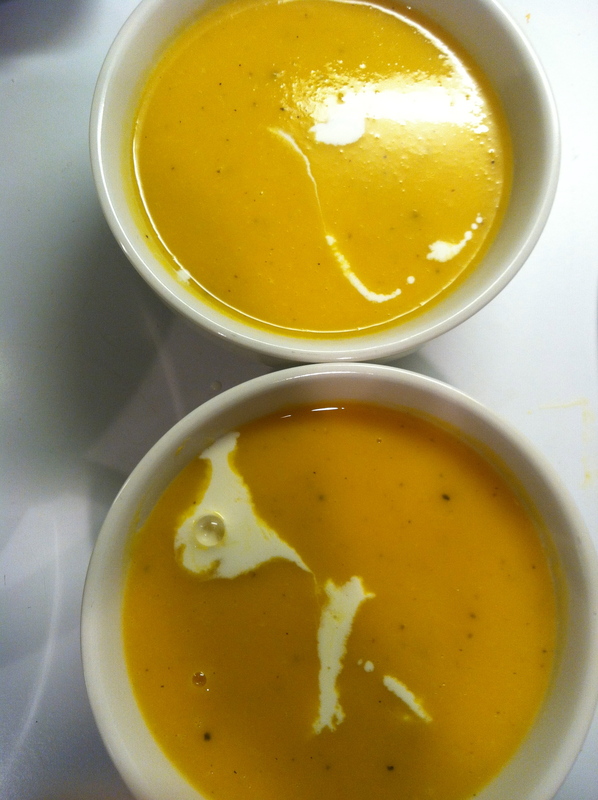 The reason I bring this up is because I made creamy butternut squash soup last week (yeah, it’s a FAKE blog, guys…I might be late on posts sometimes). It’s a recipe adaptation from Food 52 that I found on YumSugar. And it was EASY. And it was GOOD. 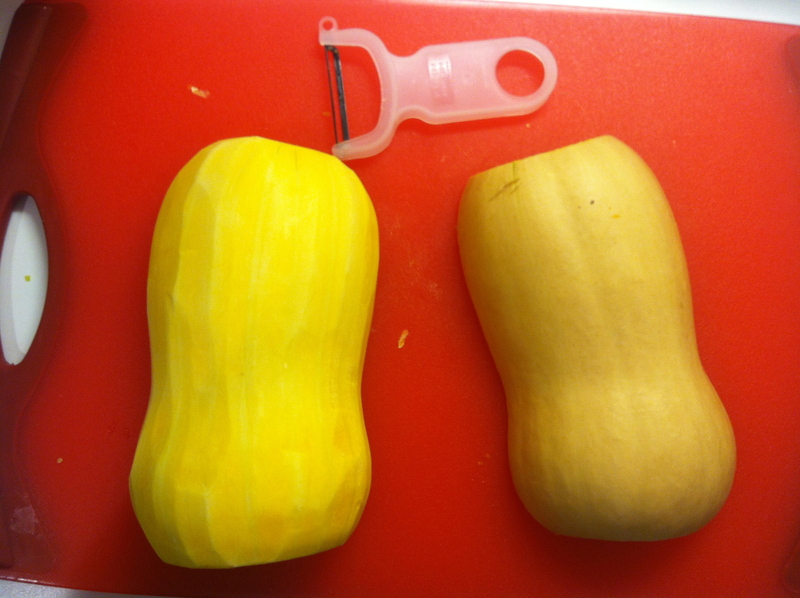 Except for the whole cutting-the-butternut-squash-oh-holy-crap-I’m-pretty-sure-I’m-going-to-cut-all-of-my-fingers-off thing. But other than that, REAL easy. Great flavor. Comforting. Comes together fast. That is, if you managed to keep your wits about you and keep your fingers connected to your palms. There is one thing I had to go out and invest in before I did this recipe, though. And that is a Y peeler. I went to William Sonoma at the mall, expecting to shell out tons of bucks. And I was pleasantly surprised to find out that it only cost me 4 American Dollars. That made the whole squash peeling situation so much easier. I made this soup for myself and my friend Em. Our only complaint was that it made us really tired. We both had the soup and then promptly went into a food coma. Like, lethargically flipping through a magazine and barely speaking to one another food coma. 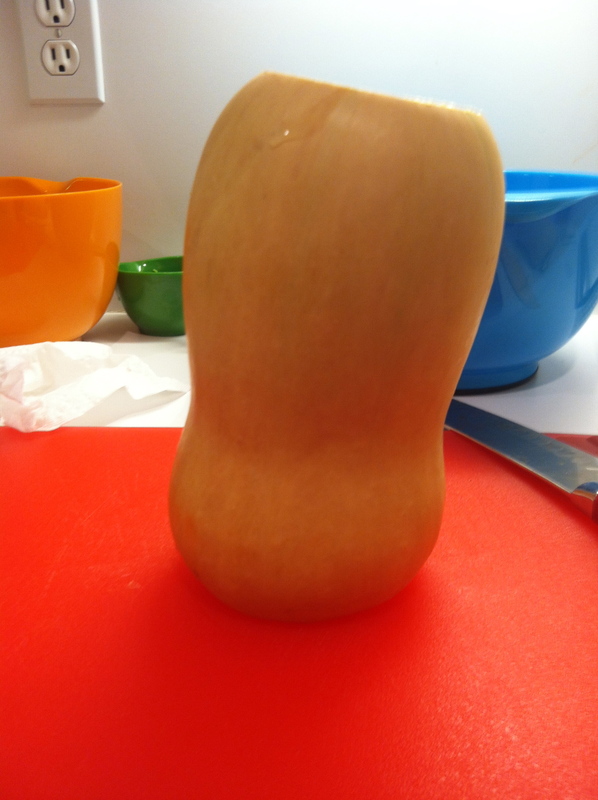 Does butternut squash have some sort of naturally occurring roofie in it? ¼ teaspoon freshly grated nutmeg | I bought some of the actual nutmeg….nuts? Alton Brown said they last for years vs. the store bought, pre-grated stuff which loses its flavor within weeks. He wears glasses. I trust him. 2 to 3 cups chicken or vegetable stock | I used 3 cups of chicken stock. To clean the leeks, trim off dark green part and spiky, white Guy Fieri-hair at the bottom. You want to use the white and light green parts only here. Leeks live in the dirt, so they’re really, really gritty. I typically split them down the middle like a hot dog/longitudinally (that was for you, Ben), and then cut them into thin half moons. Then, let them soak in a bowl of water for 10 minutes or so, changing the water out a couple times and moving the leeks around to get all the dirt and grit out. The dirt should settle on the bottom of the bowl, so when you’re done, transfer your leeks to a paper towel to dry. Boom. Clean leeks. 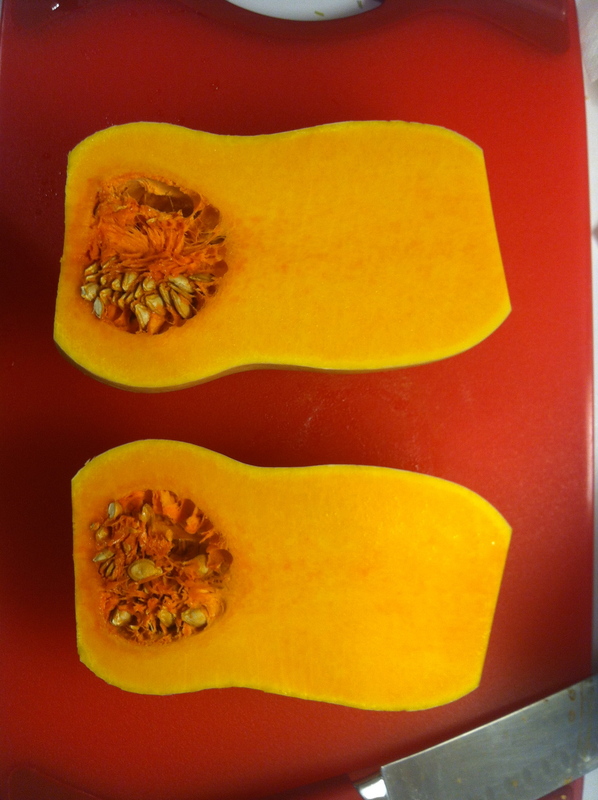 To peel and cube the butternut squash, here is a lovely step by step demo that I borrowed from YumSugar. First, remove the ends. WATCH YOUR FINGERS. Then, cut down the middle/longitudinally/like a hot dog. Scoop out the butternut squash guts. Make sure you get all the little strings out because the blender won’t catch that and you’ll have little annoying guts in your soup at the end. Lay flat and peel with your Y-peeler, available for 4 American Dollars. 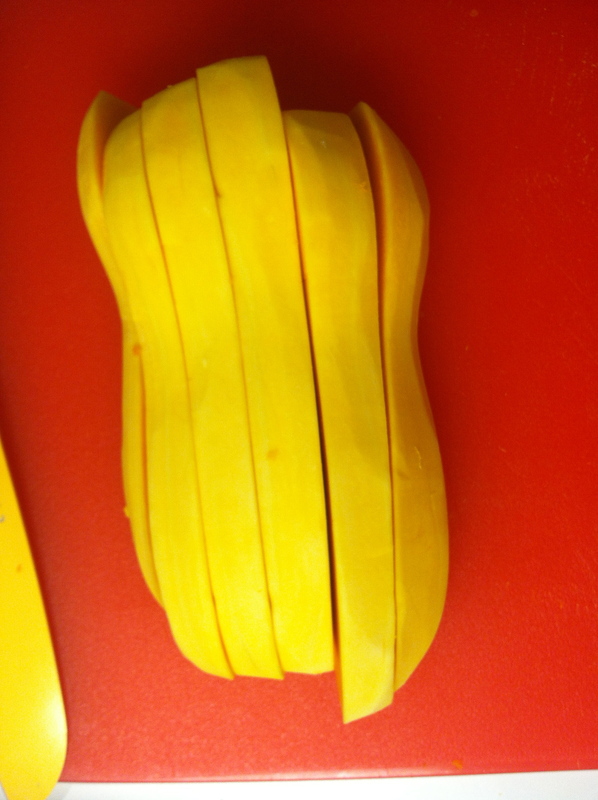 Cut the butternut squash into fingers. Melt the butter in a medium stockpot or dutch oven over medium-low heat. 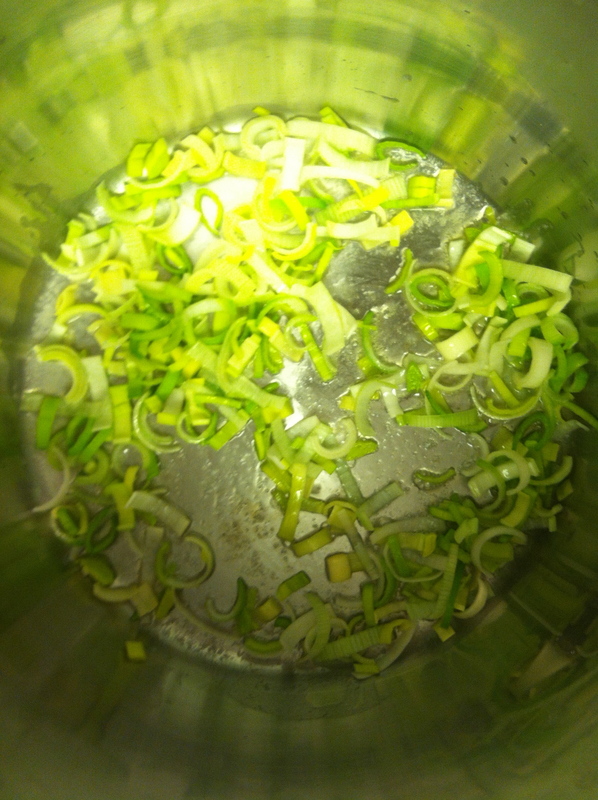 Add the leeks and sweat, stirring occasionally, until softened but not yet browned, about 5 minutes. 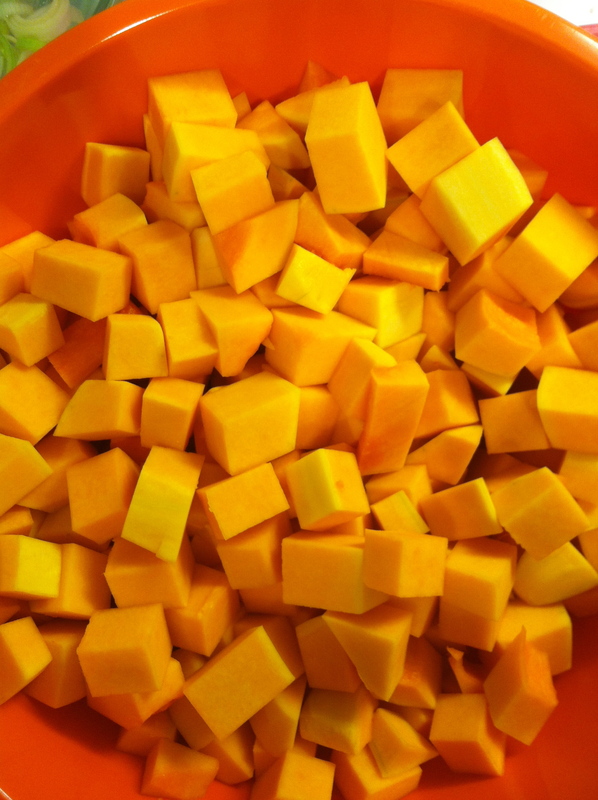 Add the butternut squash, nutmeg, pepper, and ½ teaspoon salt, and cook, stirring occasionally, for another 5 minutes. Add the sherry to the pan and cook for 2-3 minutes, or until reduced slightly (something that I didn’t really notice happening), then add enough stock to just cover the vegetables. If 3 cups isn’t sufficient, make up the difference with water. I think I put an extra cup of water in. Simmer uncovered for about 20 minutes, or until the squash is fork-tender. Add the milk and 2 tablespoons cream and blend until smooth, either using an immersion blender or by carefully transferring to a blender in batches. Be careful with that blender, y’all. Hot things in a blender means hot things in your eyeballs. Season to taste with salt, pepper, sherry, and sherry vinegar. Literally, I just did a little glug of the sherry and the sherry vinegar. Maybe about 1-2 tablespoons each. Ladle into bowls and drizzle with cream. If you managed to make it to the end of this recipe with all of your limbs, bravo! You are now free to enjoy very creamy soup that is actually pretty healthy in addition to delicious. If you did not manage to make it to the end of this recipe with all of your limbs, that’s ok too! Duct tape a spoon to your bleeding used-to-be-a-hand. This soup is too good to be missed. Someone will drive you to the hospital later.